Simple, delicious and ancient. It’s not difficult to understand why stir fry has endured the test of time. It’s healthy, easy-to-prepare and there are so many variations! Today we’re bringing you a recipe for traditional Chinese stir fry, but first, let’s take a quick look at its history. 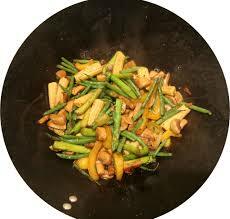 There is evidence that the stir frying technique was first practiced during the Han Dynasty (206 BC – 221 AD). Inscriptions of the Chinese character “chao” (炒), which means “stir fry”, on bronze vessels point to stir-frying being used in parching grain, and archaeological evidence of woks, along with thinly cut strips of meat, suggest it was also employed as a cooking method. By the time of the Song Dynasty (960-1279 CE), stir fry was being used regularly. Remarkably, we have 12 surviving stir fry-related recipes from this time period. Initially, stir frying was reserved for the upper classes. Steaming and boiling were much less expensive for common folk because they required no oil. However, when fuel prices began to rise, stir frying became more popular throughout the classes as it allowed for food to be cooked very quickly, thus saving fuel. Another benefit of quick cooking: the food retained its nutrients. This is a common theme throughout history. Popular dishes and methods of cooking had little to do with the flavor of food, which we prize so greatly today. Instead, people focused on foods that could be cooked efficiently, with little cost, and that provided high nutritional value. Today, many of us are turning to these time-tested cooking methods and ancient dishes because we realize the importance of nutrition. Stir frying is an excellent way to connect with the ancient past, and with the addition of a bounty of available spices, savor a variety of dishes today. *The amounts of each ingredient will vary depending on the amount of vegetables you are using and your taste preferences. Heat oil over high heat in a wok. Add the ginger and garlic. Stir fry for a minute or less, until they begin to smell delicious. Remove and set aside. Add the onion. Stir fry for a couple of minutes before adding the other vegetables. If you are using leafy vegetables, add them after all of the other vegetables have been stir fried for several minutes. Add the ginger and garlic back into the wok. Pour in a small amount of broth, about ¼ cup. Stir fry until all of the veggies are tender, but still crispy. Add another ¼ or so of broth, along with the cornstarch and soy sauce. Stir fry for about a minute more before serving immediately. Wilkinson, E. P. (2015). Chinese history: A new manual. Cambridge, MA: Harvard University Asia Center, Harvard University Press. Anderson, E. N. (1988). The food of China. New Haven: Yale University Press. This entry was posted in Blog, Bon Appetit Wednesday, Culinary, Culture and tagged ancient food, ancient history, ancient recipes, ancient stir fry, AntiquityNOW, Bon Appetit Wednesday, Chinese stir fry. Bookmark the permalink.